This site is brought to you by the Seadragon Alumni Association to preserve the memories of the good ship Seadragon and all those who served on her during her lifetime. 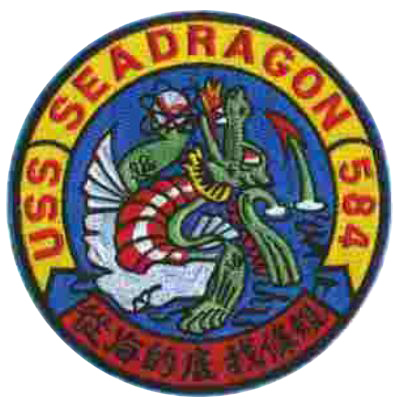 The site contains the histories of the two Seadragons (194 & 584), bio's of some of the 584 Captains, rosters of crew members with addresses for over 900 at present. Reunion information of past and future reunions. Links to other submarine sites, USSVI and some of their bases and other links to topics of interest to submariners. If you have served on Seadragon, we invite you to check the roster for your name and current address and to fill in the forms provided so your shipmates can contact you. You are also invited to join the Seadragon Alumni Association; you can do this on line or copy the form and send it snail mail. There is also a form to let us know your intentions for the next reunion in NORFOLK, VA. The dates will coincide with the USSVI Convention to be held in 2012. All forms can be reached by clicking on Alumni on the left hand side of this page. All pages of this site can be accessed by clicking on the words on the left side of the page.